Here’s a boutonniere I made (yes, hand crafted). Look closely and you’ll see that it’s made of a pineapple leaf, rosemary sprig, habanero, and some baby breath. 100% edible, well, maybe not the baby breath. The idea here is to capture a theme. There’s only so much a guy can do to dress up an outfit and the boutonniere is definitely one of the highlights. 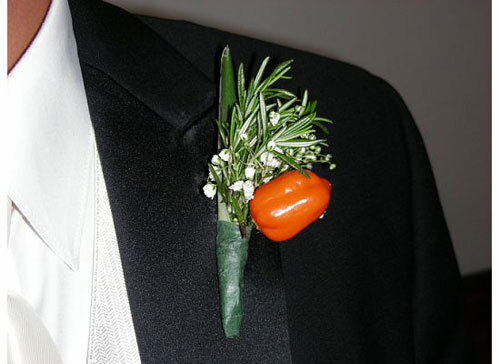 I’ve seen some crazy non-floral boutonnieres out there. The way I see it, if a guy has to wear one, why not match his personality? How about making a boutonniere out of nuts and bolts or computer parts? My next boutonniere might have one of those hidden cameras with a little decoration from other techie gadgets. Recipes? I’d add a quarter of this pepper to any chili recipe to add heat. Yes, only a quarter. I tried using the whole and even half of the pepper and it burns. Or add a little to your favorite salsa recipe. Notes: Use caution if you do decide to use a habanero because they are the hottest peppers out there. You should also warn the wearers. I found this video. It was the only decent video I could find because the rest were mostly about people who were dared to eat it. Mind you I’ve paid to watch people eat a habanero. I’m not sure if it’s worth the $20.